The name Satoshi Furuya might not ring a bell with some, but the character he played certainly will -- Ultraman. For 39 episodes Furuya battled scores of monsters that opened up a wildly successful string of superhero shows for decades. 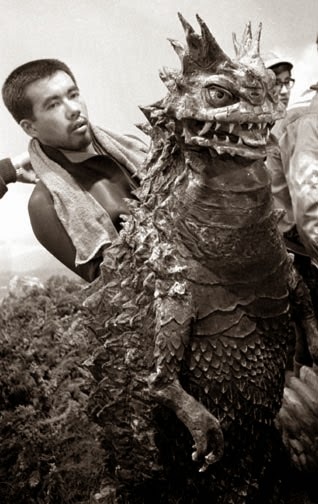 Furuya started out as a bit player at Toho, and had appeared in a few monster epics prior to his most famous role. 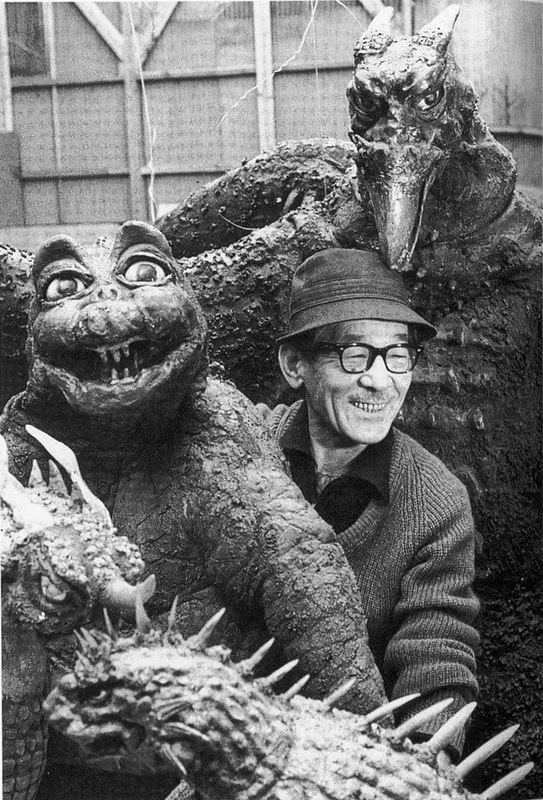 Like many performers in the kaiju business, Furuya had the opportunity to work with Haruo Nakajima while on ULTRAMAN. Nakajima played opposite Furuya as an assortment of monsters on five occasions; one of which was episode 10, 'The Mysterious Dinosaur Base' wherein the monster Jiras -- two different Godzilla suits with a large frill added to the neck to hide the seam -- had Nakajima inside the costume. Satoshi Furuya also played a small part as a hotel employee in this episode. For episode 39, Furuya did double duty as Zoffy, the eldest Ultra brother who comes to return his sibling to the Land of Light. The actor best known for playing the Nebula M-78 superman likewise played a more substantial human character in the second Ultra hero series, ULTRASEVEN (1967) as Ultra Guard member Amagi. ULTRASEVEN ('67), the follow up to ULTRAMAN, was another huge success for Tsuburaya. With Satoshi Furuya reluctant to put on the wetsuit once more, martial artist and sports enthusiast Koji Kaminishi took the mantle of this new savior from Nebula M-78. Koji had a muscular, 'V' shaped build that gave U7 a distinct, comic book look. Like Satoshi Furuya before him, Koji played a few bit parts over the course of his ULTRASEVEN tour. He got in the business in 1955 with dreams of being a director. He ended up waging a weekly war with giant monsters instead. Kaminishi was a disciple of the famous sword fighting choreographer, Misaki "Kuze Dragon" Gentaro. The athlete followed up U7 in the suit acting role of another popular spaceman character in SPECTREMAN (1971). Prior to playing a Tsuburaya superhero, the athletic Koji acted in a few of Akira Kurosawa's movies. In the late 1970s, he became a producer and tried to get his own superhero television series off the ground in the early 1980s. Eiichi Kikuchi has had one of the longest, and busiest careers of the Ultra suit actors. Like those before him, he's performed in front of the camera both in and out of monster suits. DENJIN ZARBORGER (1974), BATTLE HAWK (1976), SPIDERMAN (1978), BATTLE FEVER J (1979), and DAI SENTAI GOGGLE V (1982) are among his actor credits. In-suit roles include TV programs like AMBASSADOR MAGMA (1966), MONSTER PRINCE (1967), FIGHT! MIGHTY JACK (1968) and the obscure MAJIN VANDER (1969). 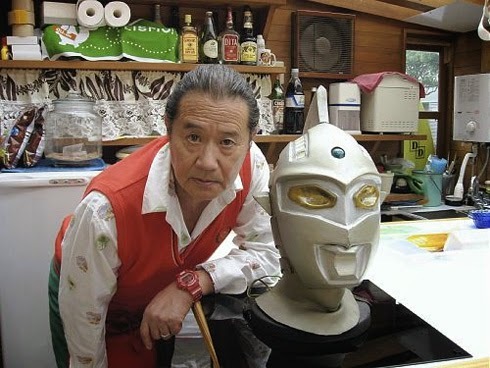 His biggest break came in the form of an M-78 spaceman, KAETTE KITA ULTRAMAN (RETURN OF ULTRAMAN, alias ULTRAMAN JACK). Kikuchi was said to have initially refused the role after getting first hand knowledge of the hardships involved when he stepped in for Koji Kaminishi to play U7 for the exceptional two-parter, 'Invasion from Outer Space parts 1 and 2'. He allegedly referred a bodybuilder (Nakaoka Shintaro) for the role instead, but considering the slender build of model Jiro Dan (who played Jack's human alter ego), Kikuchi was approached again. After calling the producers bluff by declaring he be paid nearly twice the original fee, plus a character role, his demand was agreed to, and he ended up accepting. Eichi Kikuchi reprised his U-Jack role, albeit briefly, in the first episode of ULTRAMAN ACE (1972). The Japanese take their kaiju very seriously. The artisans literally pour their heart and soul into their creations; just as the actors performing inside of them form a bond with the latex "skin" they wear. So when it comes time to bid farewell, it's a melancholic occasion akin to burying your loved ones. 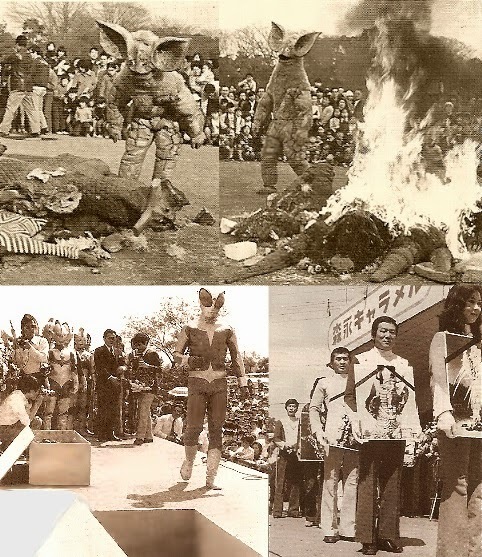 On April 22nd, 1973, a "Monster Memorial" of sorts was held at Futakotamagawa Gardens in Tokyo. A number of apparently well-worn monster suits were laid to rest by cremation, and buried in front of a crowd of spectators. In attendance were Shin Kishida and Mutsumi Gori (both men are visible in bottom right photo). 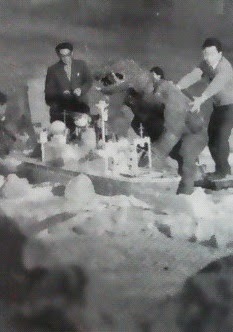 Shinoda Saburo of ULTRAMAN TARO was also among the mourners. As sad an occasion as a kaiju funeral may be for some, cremating those rubber monster suits that had kids riveted while watching their theater and television screens was a bit more dignified than those that are left to rot in studio back lots, or junkyards. Others serve a more noble cause and are saved, albeit in various stages of decomposition for display in museum exhibits. 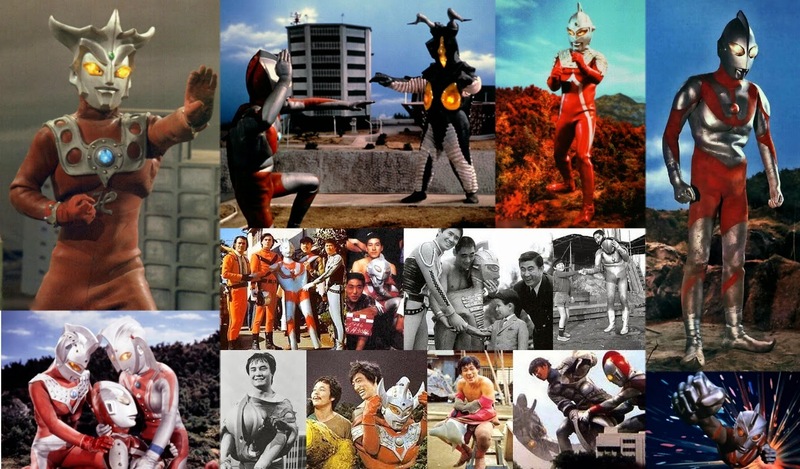 Some of the suit actors for Tsuburaya's Ultra shows, for whatever reason, didn't stay in the business long. As for the unique ULTRAMAN ACE, Shoji Takeuchi put on the suit of the title spaceman from episode 3 to the end. 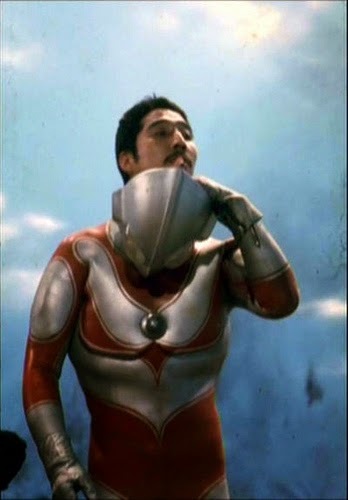 Hiroshi Nagasawa was Ultraman Taro for 53 episodes and did little else. A multitude of stunt men performed suit acting duties as ULTRAMAN 80, but only Kenji Fukuda seemingly had a lasting career out of the bunch. Of the few that came after the popular RETURN OF ULTRAMAN (1971), only the stuntman that played U-LEO (1974) had a lengthy career. As Ultraman Leo, Tatsumi Nikamoto (see above) was incredible performing inside the wet suit pulling off a near constant stream of acrobatic maneuvers in action scenes. A martial arts choreographer, he became a member of Sonny Chiba's Japan Action Club in 1971. With everybody "kung fu fighting" around the world at that time, U-LEO had a preference for kung fu combat as opposed to special effects attacks. ULTRAMAN LEO was a mostly somber affair in front of, and off screen. The ratings were not good as previous series', and apparently the actor suffered some injuries while playing the Nebula L77 alien. A staff member named Kazunori Kawaguchi was set to play Leo, but desired a mere guest appearance of Ultraseven in the first episode because of the characters stature, and also the popular Eye Slugger. Nikamoto's other credits include Titanosaurus in TERROR OF MECHAGODZILLA (1975), the upper body of the Triceratops in THE LAST DINOSAUR (1977), and the giant superhero in the bizarre SciFi series DINOSAUR WAR AIZENBORG (1977). Of the dozens of men playing giant monsters and robots, or kung fu fighting superheroes that piloted enormous robotic machinery, there were relatively few women among their ranks. Possibly the busiest of the small number of female stunt suit actresses is Naoko Kamio. Primarily known for being a stunt woman in Super Sentai programs, she has appeared in movies, too. Naoko was underneath the suits for both Minilla and Rodan in GODZILLA FINAL WARS (2004). She has also done dubbing for women in action series. She is married to the man that played Gamera in GAMERA 3 (1999), stuntman and suit actor, Fukuzawa Hirofumi. 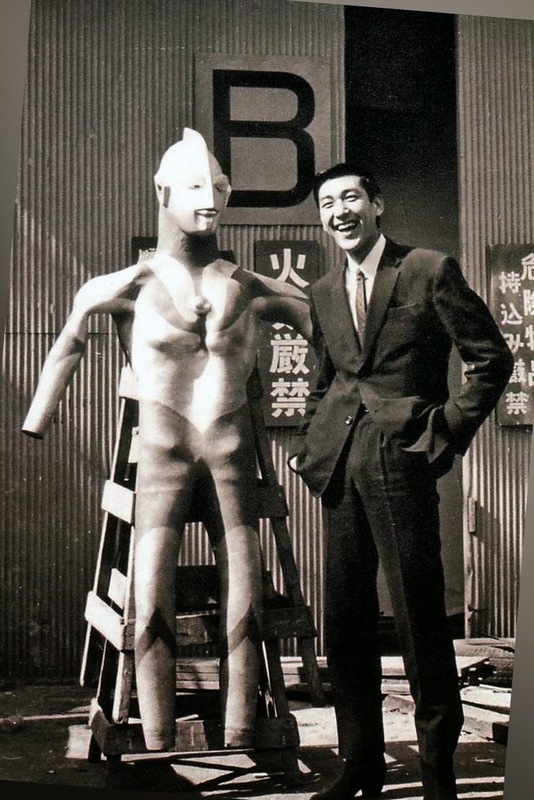 One of the busiest suit actors during the Golden Age of Japanese giant monster cinema was Teruo Arakaki (see insert), a man who worked for Toho, Daiei and Tsuburaya Productions accumulating an incredible body of work in just a couple of years. Despite the dangers he encountered, the actor apparently found the jobs exhilarating. Known primarily for his television work on ULTRAMAN (1966), Arakaki played monsters on the hit Tsuburaya show in 15 episodes. Additionally, his services were retained for five episodes of ULTRASEVEN (1967). Outside of his TV work, Arakaki's biggest claim to fame is likely being inside the cumbersome, heavy Gamera suit for three films in Daiei's Showa series; those entries being GAMERA VS. BARUGON (1966), GAMERA VS. GYAOS (1967) and GAMERA VS. VIRAS (1968). For Toho, Teruo Arakaki played Rodan in DESTROY ALL MONSTERS (1968) and a giant rat in LATITUDE ZERO (1969). Ultraman remains a lucrative industry in Japan, and on the international scene, but remains a cult commodity in the United States. Restaurants and theme parks were built around all things Ultra. Koji Moritsugu, the actor who played Dan Moroboshi in ULTRASEVEN, owns his own restaurant named Joli Chapeau. Inside his establishment are assorted memorabilia, including the original U7 mask. Unfortunately, the Land of Light dimmed on July 25th, 2011 when a thief broke into the restaurant during off-business hours and stole the mask from its display case. Coincidentally, the 'Type B' Ultraman mask (from the original '66 series) was stolen sometime in the 1970s. With over 20 Ultra series' made in Japan (two made outside Japan in Australia and America), and a merchandising bonanza -- not to mention a recent series titled ULTRAMAN GINGA (2013), the color timer on Eiji Tsuburaya's creation hasn't begun flashing just yet. The thought of lumbering around inside a rubber suit and smashing miniature sets may not be taken all that serious by some, but for those underneath hundreds of pounds of latex, it's no laughing matter; especially considering all the potential for serious injury, or even death. For instance, Haruo Nakajima suffered a great deal for the craft he was impassioned about. 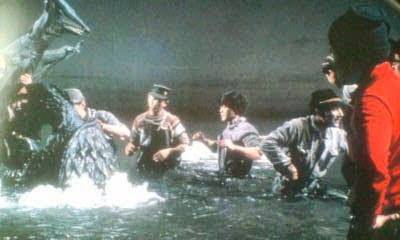 In GODZILLA RAIDS AGAIN (1955), he was nearly buried under hundreds of pounds of ice that caused the platform he was on to collapse; a cable hoisting him some 20 feet into the air as RODAN (1956) broke sending Nakajima into the big pool below; explosives burned his stomach in VARAN (1958); he claimed to not be bothered by shooting suited scenes in the pool, but Nakajima nearly drowned shooting KKVG in 1962; While not even skipping a beat, the G head piece briefly caught fire in MOTHRA VS. GODZILLA (1964) during one of the military assaults. Tsuburaya suit actor, Toru Kawai was set aflame while in the Godzilla suit after being pounded by Mechagodzilla's hail of rockets and lasers during the finale of TERROR OF MECHAGODZILLA (1975). Incredibly, the shot remains in the film. Kenpachiro Satsuma (above at right; suit actor Hurricane Ryu at left) has been fairly vocal about the difficulties suit acting can bring. 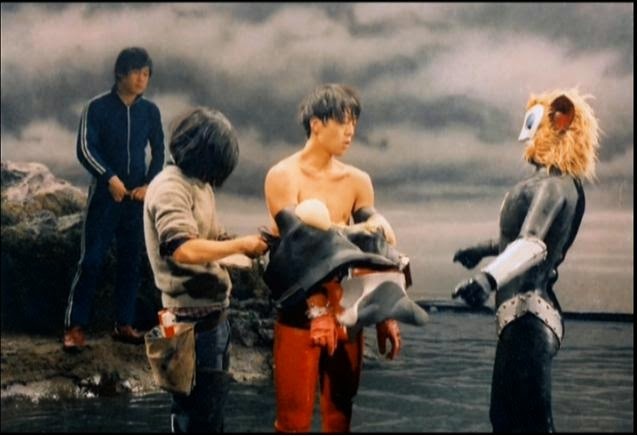 Rain machines pouring water onto him during a sequence in BIOLLANTE made maneuverability almost impossible since the suit absorbs water; he passed out in the pool multiple times resulting in the suit filling with water nearly drowning him; a falling stunt in GVKG went well save for the part where Satsuma hit his head against the set platform; and Satsuma reportedly fainted some six times after inhaling gas fumes in the G suit from GODZILLA VS. DESTROYER in 1995. 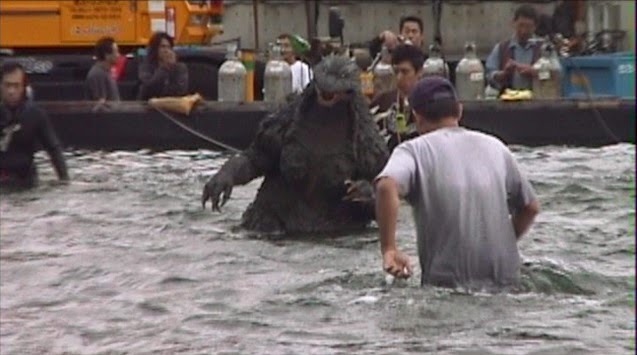 Tsutomu Kitagawa (pictured above about to tip over in the Godzilla suit) experienced his own rather scary suit monster nightmare when his breathing apparatus came loose while he was lowered underwater during a scene requiring him to rise from the sea. With the costume filling with water, no one would notice his dilemma. He was raised with the assist of a crane before anything life-threatening took place. Suit actors also had to contend with dehydration, lack of oxygen, slick surfaces (algae-caked bottom of the pool), and no air conditioning (in the Showa days) that made performing under all that rubber even more uncomfortable. The use of gasoline and gunpowder for explosions increased the hazardous possibilities the job brought with it. Still, these actors provided a great deal of escapist entertainment for their fans even if they went through hell to do it. Upon graduating art school in Osaka, Toshimitsu Teizo wasn't long for finding employment in the film industry. Under the aegis of Eiji Tsuburaya, Toshimitsu's early miniature work on THE WAR AT SEA FROM HAWAII TO MALAYA (1942) ultimately led to his sculpting models, and the monsters first for GODZILLA (1954) -- followed by a menagerie of other behemoths. In his early works, the accomplished artisan had a knack for creating creatures with a certain ferociousness about them. 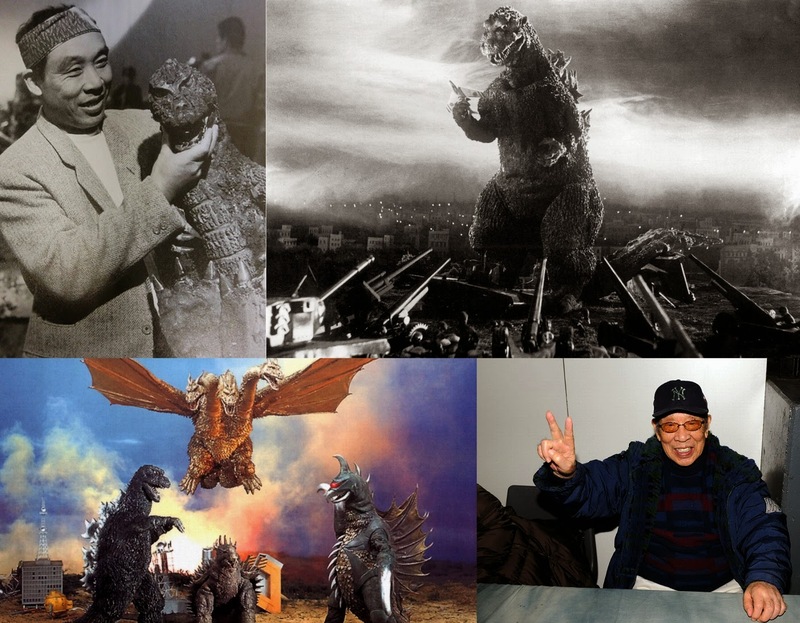 Some of his contributions to the Japanese SciFi film industry include Anguirus ('55), Rodan ('56), Varan ('58), King Ghidorah ('64), Mechani-Kong ('67), and Kumonga ('67). Born in 1909, Toshimitsu Teizo passed away in 1982. 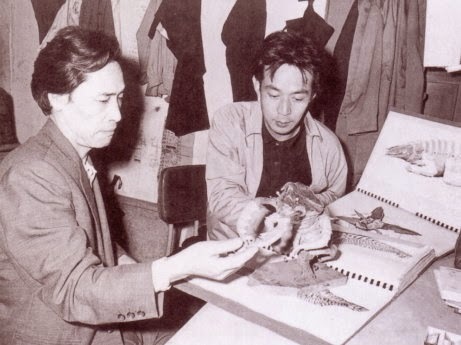 The talented, and proud artist/sculptor Toru Narita (above right with Ryosaku Takayama) began his career as a miniature builder on Toho's first two Godzilla pictures before moving into television where he became the art director for ULTRA Q (1966), ULTRAMAN (1966), ULTRASEVEN (1967) and MIGHTY JACK (1968). Reportedly, Narita became increasingly frustrated over the deviations of his creature designs, and he left the company in 1968. Over ten years after his exit from Tsuburaya, Narita was involved in legal entanglements with his former employers over the use of Ultraman and its monster characters in his published art books. He died from a stroke in February of 2002. Toru Narita designed the many aliens and monsters on Ultraman, including the iconic title spaceman. Under Narita's guidance, sculptor Sasaki Kimyo (miniature builder from ULTRA Q; see insert) was tasked with bringing Narita's concept to life. 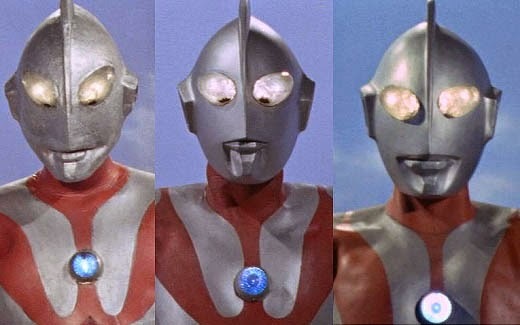 Three masks (see above) for the Ultra hero were made over the course of the 39 episode run -- Type A was seen in episodes 1-13; Type B from 14-29; and Type C finished out the series from episode 30-39. Kimyo was good at transforming old costumes into new creations, thereby saving on money. For example, Gabora (ep.9) and Jiras (ep.10) were modified Baragon and Godzilla suits respectively. The alterations made to Alien Baltan's second appearance was Kimyo's work, too. 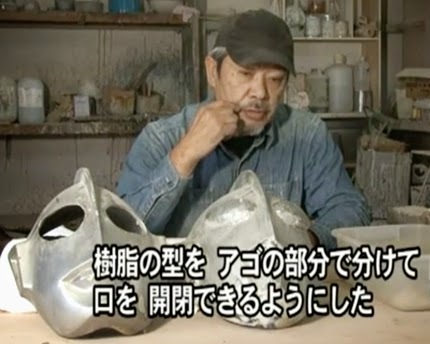 Sasaki Kimyo went on to build the Ultraseven mask, and the shoulder protector of the suit. Masao Yagi came from a family of artists. 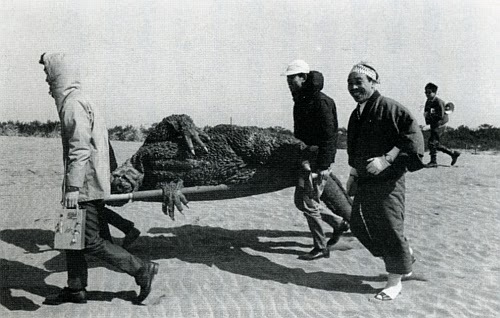 Like many of Japan's technicians in the special effects field, he contributed to the original 1954 Godzilla production. Joining Daiei in 1956, Yagi worked on THE INVISIBLE MAN & THE HUMAN FLY (1957). This was Daiei's second Invisible Man movie preceded by THE INVISIBLE MAN APPEARS in 1949 (Toho did their own version -- THE INVISIBLE MAN -- in 1954). 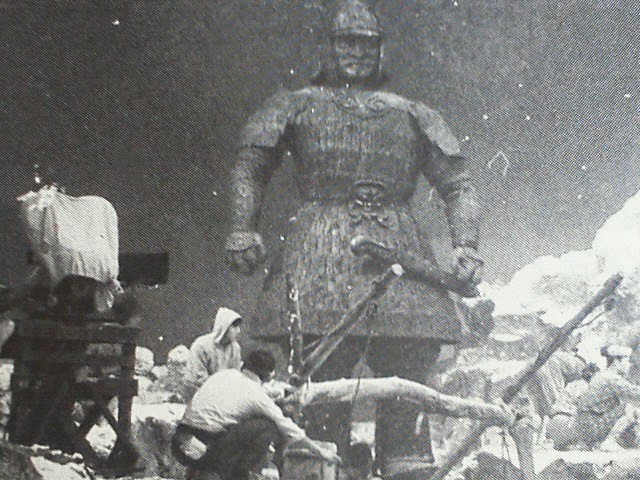 He was asked to work on Daiei's ill-fated GIANT HORDE BEAST NEZURA in 1963, but declined, and left the company for NTV (Nippon Television Network Corporation) in 1964. 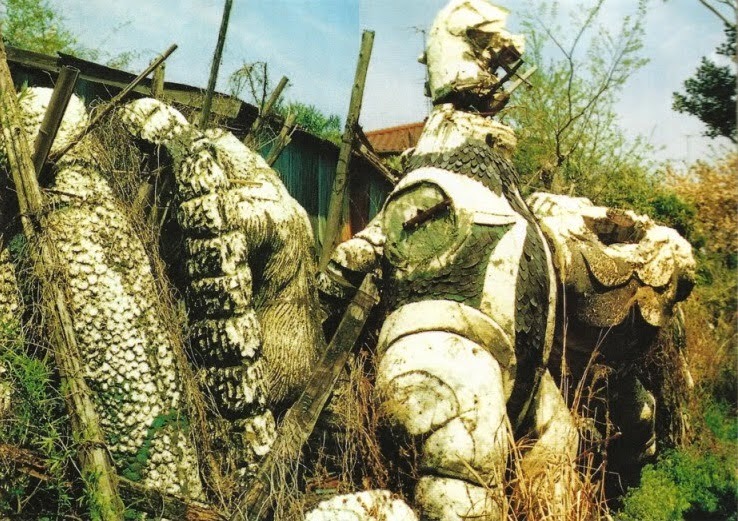 Not long after, monster model making machine, Ryosaku Takayama was offered the GAMERA gig (he'd built monsters for GHBN, but the film was scrapped shortly into production), Daiei's first foray into the kaiju kingdom after the failed NEZURA. Takayama turned it down as he was immersed in ULTRA Q at that point; and it was then offered to Yagi. With NTV involved in a labor dispute at that time, he was freed up to work on the project. Using Akira Inoue's designs, Yagi began constructing the original Gamera suit for GIANT MONSTER GAMERA (1965) with help from his SPX colleagues, Michio Mikami, Akira Suzuki, and Murase Tsugizo. Since the Japanese film industry was set up similar to the old Hollywood Studio system, Yagi built what was ostensibly a small garage at his home so his effects associates who were working at Toho could participate in off hours. By 1966, Yagi founded Ekisu Productions, a model making company with his GAMERA collaborators. They constructed various monsters for the resultant Gamera sequels; the South Korean YONGARY, MONSTER FROM THE DEEP (1967); the second and third in the DAIMAJIN series; and small-screen programs like KAMEN RIDER (1971) to name a few. By 1972, some of the members branched out to found their own model making companies such as Cosmo Productions. One of these offspring effects houses was the Tsueni Company Limited by sculptor/special effects artist Murase Tsugizo (also listed as Keizo Murase). His company worked on such pictures as Toho's TERROR OF MECHAGODZILLA (1975), Shaw Brothers THE MIGHTY PEKING MAN (1977) and Kadokawa's LEGEND OF THE EIGHT SAMURAI (1983). The giant snake props in Shaw's THE SNAKE PRINCE (1976) were Tsugizo's work, too. It's worth mentioning that during his tour on the MIGHTY PEKING MAN production, Tsugizo (in insert pic) performed the stunt inside the very suit he built during the fiery finale wherein Utam falls from the top of the Jardine House (formerly Connaught Center). Akin to Fuminori Ohashi, this was a rare instance where the creator played the creation. 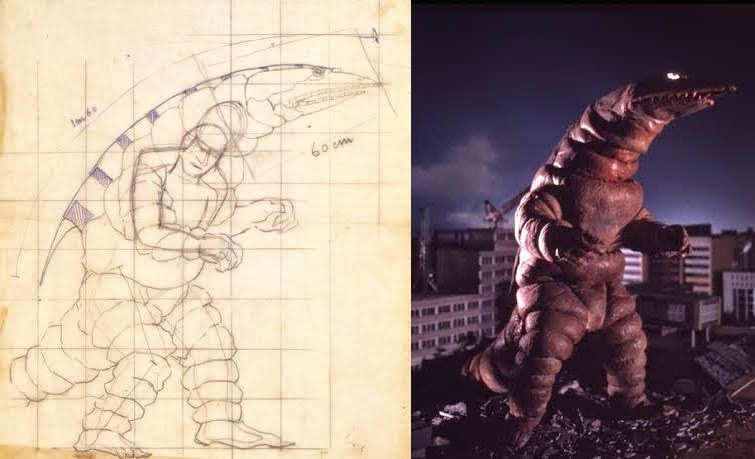 At left is Takayama's design for ULTRAMAN monster Telesdon. At right is the finished suit. Born in 1917, Ryosaku Takayama showed an early knack for painting. Urged by his brother to pursue his talents, Takayama did factory work in his teenage years while honing his artistic skills in his off time. He was a suit builder who worked primarily in television, but managed an incredible load on assorted kaiju movies. 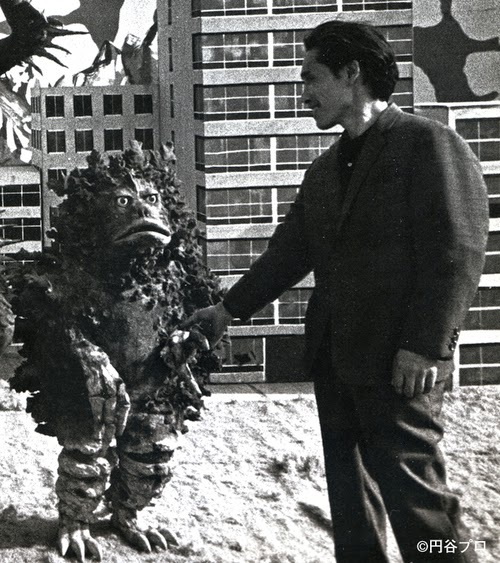 When Daiei's giant killer rat movie GIANT HORDE BEAST NEZURA was cancelled in 1964 (due to health hazards after some of the live rats escaped from the set), Takayama was offered a job with Tsuburaya Productions making monsters for the ULTRA Q (1966) series. He then worked in the same capacity on ULTRAMAN and ULTRASEVEN. With such short shooting schedules, Takayama remodeled a lot of old monster suits to look as much like new kaiju as possible. 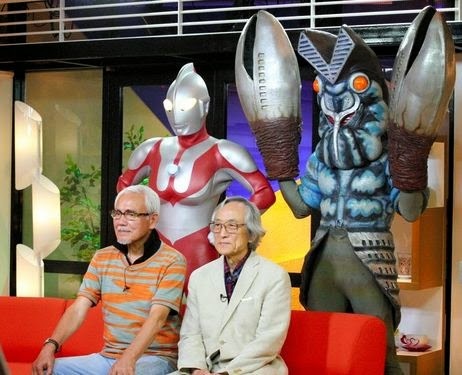 He fashioned at least three suits for RETURN OF ULTRAMAN before moving on to other television projects. In between this busy period, Takayama somehow found time to work on movies like DAIMAJIN (building a full-size model and a miniature), and DAIGORO VS. GOLIATH (1972). The prolific monster maker succumbed to liver cancer in July of 1982 at the age of 65. The Works of Ryosaku Takayama, an art book of his kaiju creations was published in 1991. Exhibits of his efforts have been on display over the years. Recently, in the summer of 2013, some of his original designs for ULTRASEVEN were on display in Tokyo for an U7 exhibition. Shinichi Wakasa is among the last generation of suit makers in this computer generated era. In 1975 he was working on the long-running KAMEN RIDER series as a stunt performer for a Japanese action group named Ohno Kenyu-kai (also listed as Ono Kento-kai). When a stint with Cosmo Prod. 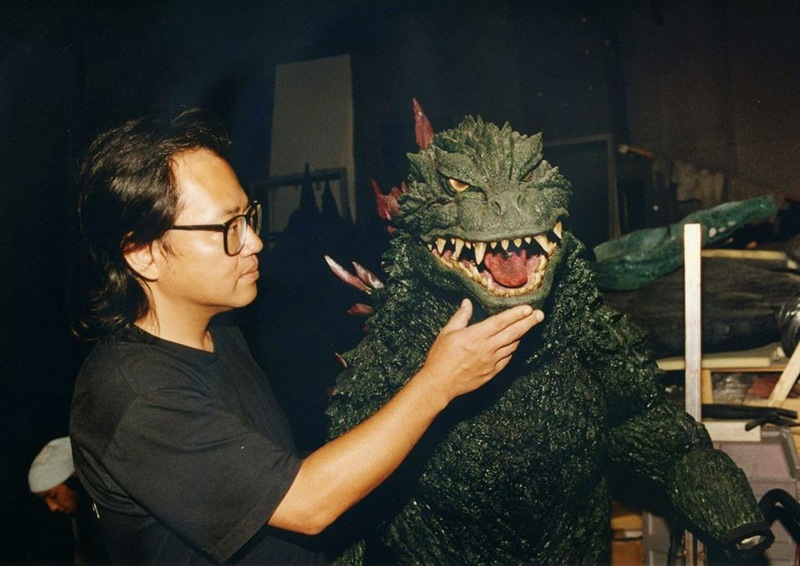 didn't pan out, Wakasa formed his own company in 1980 at 20 years of age, christening it Monsters Inc. alongside friend and colleague, fellow suit builder, Tomoo Haraguchi. Working on Ultra shows like ULTRAMAN 80 led to Toho where Wakasa would find himself constructing monsters for GODZILLA VS. MECHAGODZILLA (1993), GODZILLA VS. SPACE GODZILLA (1994), YAMATO TAKERU (1994), GODZILLA VS. DESTROYER (1995) and Toho's MOTHRA series (1996-1998). Wakasa and his team likewise worked on all but one of the Millennium Godzilla series (the Kaneko entry). For Daiei, Monsters Inc. handled the 'legion' of voracious, cyclopean bug monsters. The monster maker continues to have a busy schedule on films, television, and public attractions. 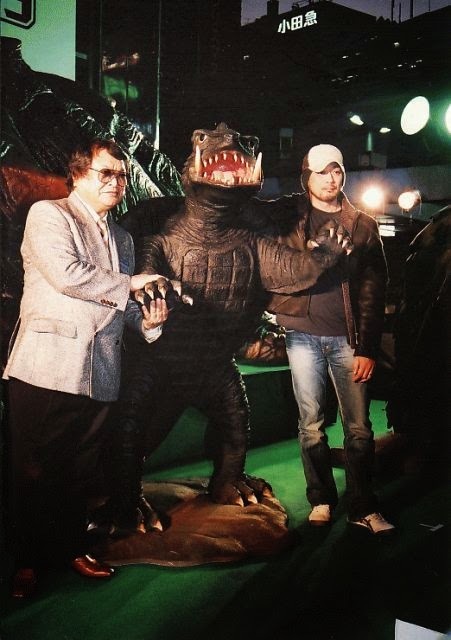 Tsutomu Kitagawa (left), Kazahiro Yoshida (middle), Nakagawa Moto-shu (right): rehearsing for Godzilla, Gigan and Monster X battle for FINAL WARS (2004). Bottom photo is filming. 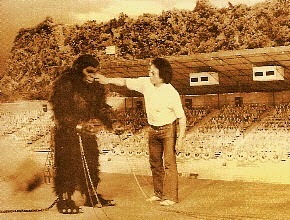 There are numerous others who made their mark in Japanese special effects. 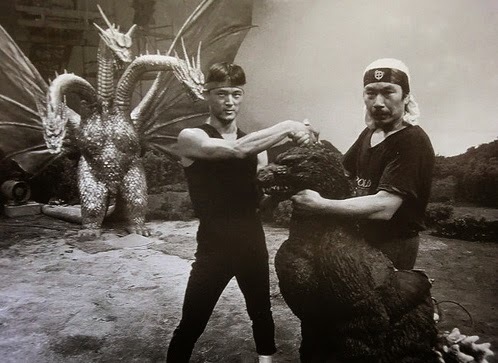 Whether it be in suit acting (Izumi Umenosuke played Gamera in GUIRON and JIGER; Kasumi Kinichi was both Anguirus and King Seesar in GVM; Hurricane Ryu was Heisei KG, baby Godzilla, etc), model making (Eizo Kaimai, Yagi brothers Koei and Kanji were assistants on GODZILLA 54), miniature designers/builders (Akira Watanabe, Yasuyaki Inoue, Kintaro Makino), many have made an impact on the Tokusatsu genre. While today the art of Suitmation is a dying art form even in its native Japan, the artisans who made it fashionable haven't been forgotten. 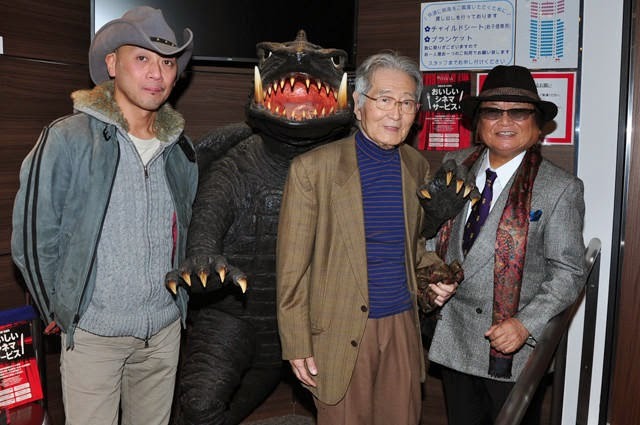 In recent years, SPX artist and director Tomoo Haraguchi (see insert; at right with Showa Gamera molder Murase Tsugizo in November 2005) has restored many of the original tokusatsu suits for a series of exhibitions in Japan. There importance on the world cinema scene is kept alive in the imagination and spirit of the men and women who took up the craft to make those monsters and landscapes come alive -- and in the minds and hearts of their fans, young and old.